Our suggestions on resources for further study of redistricting and gerrymandering. The list covers books, websites, podcasts, scholarly/in-depth articles, data visualizations, and cartoons. Ratf**ked: The True Story Behind the Secret Plan to Steal America's Democracy by David Daley. The book on the gerrymander of 2011. And (bonus!) Pennsylvania is the first chapter. The Gerrymandering Project - FiveThirtyEight: - A comprehensive series from Nate Silver and the gang, in an appealing format. Also links to the 538 podcast series on gerrymandering, in Arizona, California, North Carolina, and Wisconsin. Fair Districts PA - The website of the citizens group that is leading the push for a constitutional amendment to charge how Pennsylvania redistricts. All About Redistricting - Justin Levitt, Loyola Law School (Los Angeles). Levitt maintains an exhaustive listing of every state’s redistricting procedures for Congress and state legislature. If you want to know how a particular state draws its lines, go here first. Brennan Center for Justice - The Brennan Center provides an extensive overview of current and recent litigation on racial and partisan gerrymandering cases around the U.S. The center has a liberal perspective. SCOTUSBlog - Respected legal analysis blog’s archive of its coverage of the leading gerrymandering case of the U.S. Supreme Court’s recent term, the Wisconsin case of Gill v. Whitford. Pennsylvania Legislative Reapportionment Commission - The state site has data and process information on how Pennsylvania drew its maps for Congress and the General Assembly in 2011. Includes a timeline of important dates and details/video of public testimony. Also has an interactive map of how districts have changed in PA’s history (all the way back to 1790!). The site houses the raw Census data and corrected data used by the redistricting commission in 2011. Primer Stories - The Line Dance - A primer done by DTL Project Director Chris Satullo on the basics of gerrymandering. Public Mapping Project - Led by academics Michael McDonald and Micah Altman, this site was the marketing home for a series of public mapping contests in 2011 that used DistrictBuilder. The PMP updates its blog on a semi-regular basis, and will be active in 2021. Amandae.com - A Citizen’s Guide to Redistricting, by Amanda Holt - Pennsylvania’s No. 1 citizen warrior against sloppy election maps has put together some infographics, video, and a blog about her involvement and thoughts on Pa.’s redistricting process, both her involvement in 2011-12 and in present-day. Ballotpedia - Redistricting - Similar to Justin Levitt’s site, this gives a state-by-state account of redistricting history, procedure, and maps for reference. Ballotpedia is generally a good all-in-one stop to catch up electoral practices across the nation. Princeton Election Consortium - This blog provides national election analysis by Princeton academics, including Sam Wang, a biophysics and neuroscience professor who is a recognized expert in gerrymandering fairness. He started the Princeton Gerrymandering Project, which uses statistics and law to educate readers about redistricting and proposes nonpartisan reforms. FairVote - Resources to understand redistricting - FairVote’s mission is to provide nonpartisan solutions to give voters a greater choice and improve representative democracy. It is a strong advocate for Ranked Choice Voting. The site also offers a healthy set of graphics and explainers for redistricting and its impact across the U.S.
Redistricting Activist Guide - Common Cause - This pdf, from America’s leading nonpartisan voice for ethical government, includes messaging on why redistricting matters to the average American and graphics on what reforms are going on at each state. National Conference of State Legislatures - Data used in redistricting, the legal issues and cases that have been decided, the procedure for redistricting and the technology used for drawing the lines. Azavea. “Redistricting the Nation: 2012 Addendum” (pdf) (2012). A white paper from the Philadelphia mapping/GIS firm that created DistrictBuilder, the DTL mapping tool. Midwest Democracy Network. “Redistricting and Representation in the Great Lakes Region” (pdf) (April 2013). Altman, Micah, and Michael P. McDonald. “Using Crowd-Sourced Mapping to Improve Representation and Detect Gerrymanders in Ohio” (June 18, 2014). The Brookings Institution. “How Democrats Fooled California’s Redistricting Commission” - ProPublica, 2011 report. A detailed expose that articulates how the Democratic Party tried to influence California’s newly created independent redistricting commission in 2011. Olson, Walter. “How To Stop Politicians From Gerrymandering” (April 8, 2017). Learn Liberty, A Project of the Institute for Humane Studies at George Mason University. Accessed 2017 April 10. Gerrymandering, Explained - The Washington Post: Video explanation of gerrymandering, easy to follow and not too long. Gerrymandering: Is Geometry Silencing Your Vote? - Above the Noise: Funny video of a young man explains gerrymandering techniques like cracking and packing. Aimed at Millenials. Gerrymandering Explained - CGP Grey: Video explaining gerrymandering using animals, over 2.3 million views. Gerrymandering: Crash Course Government and Politics #37 - A Crash Course Government and Politics video in conjunction with PBS Digital Studios explaining gerrymandering. Does a good job of laying out the history of drawing legislative districts and the problems that arise from the clustering of party members by geography. Gerrymandering for Dummies - Four-minute video directed at high school students who have heard of the term gerrymandering but don’t know exactly what it is. Ted Ed Video - Ted-Ed video which explains the history of the term and explains different approaches political parties might take in gerrymandering. Higher level. Buzzfeed Pizza Video - Buzzfeed Video using pizza to explain redistricting practices. Canada Comparison Video - Upbeat, funny video comparing the American and Canadian systems. Gerrymandering explained in 45 seconds - Compares State X before and after gerrymandering. Explained by an 8th Grader - An eighth grader explains gerrymandering and why it should not be allowed. TruTV Gerrymandering Explained - TruTV video that explains gerrymandering, with examples of both parties using gerrymandering to gain an advantage. Silicon Valley Data Visualization - Interactive data lets the viewer click through the districts and see percentages of voters, PVI, and CF score. Mode Blog Finding the Most Gerrymandered Districts - Shows raw data and bar graph divided by Republican control, Democratic control, split control, or independent commission. Can You Solve Slate’s Gerrymandering Puzzle? - Puzzle game that’s really addicting. Interactive Gerrymandering Maps - The interactive maps on this site help you understand why gerrymandered districts are shaped the way they are. Imbalance of Power - The New York Times. Graphics here help you see the amount of influence gerrymandering can have. 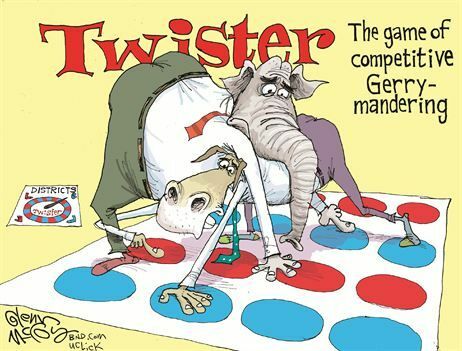 National Gallery of Redistricting Art - PJ Mathison - This site, by Pennsylvanian PJ Mathison, showcases some truly enjoyable and comic artistic interpretations of the shapes of congressional and legislative districts around the U.S.
Twister Political Cartoon - Political cartoon of the “Competitive Game of Gerrymandering.” Two animals play Twister with red and blue circles.